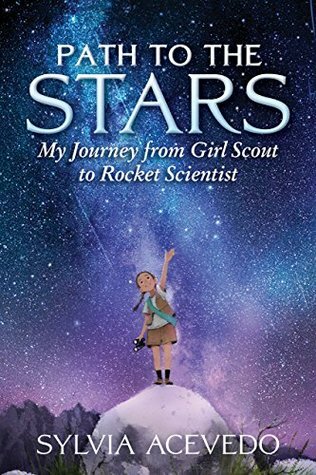 I was never a Girl Scout, but reading Path to the Stars: My Journey from Girl Scout to Rocket Scientist by Sylvia Acevedo has made me want to be one. This memoir written by the CEO of the Girl Scouts of the USA is an engrossing book for those who like to learn about life in a previous decade. This book comes out September 4, so put it on your purchase list now - you will want this for your library! Sylvia grew up poor in a small town in New Mexico. Her world was small - she mostly interacted with her family and a close circle of friends in their close-knit neighborhood. When her family bought a house in a more affluent - and white - part of town, Sylvia found herself on her own, not knowing how to bridge the gap between her experiences and the experiences of the white kids at her school. Her teachers assumed she was behind in school because of the lower income school district she had transferred from and put her in remedial classes. All this changed when Sylvia was invited to a Brownies meeting with a classmate after school one day. There, Sylvia began to learn skills that she wouldn't have otherwise had access to. Her parents were not planners, they were not savers. In Girl Scouts, Sylvia learned how to plan for events and be prepared. She learned how to budget by selling cookies to fund the events her troop wanted to do. Eventually Sylvia's mother and younger sister got involved, as well. Her mother gained skills in money management by volunteering to help with the cookie sales. Sylvia's involvement with the Girl Scouts not only enriched her life by teaching her new skills, but it enriched the life of her entire family. Sylvia Acevedo speaks so well and so passionately about the skills she learned in Girl Scouts and how they helped her gain confidence and build a future for herself that I found myself wishing I could go back in time and join myself. I kept flagging page after page where she writes about the various ways that the Girl Scouts helped her develop as a person. This is an inspiring book about one girl building a future for herself and not giving up on her dreams, even though she was repeatedly told that girls couldn't fix cars/be scientists/etc. Repeatedly, Sylvia was shown ways that men and boys had more value than women. Her brother was given a library card without even asking for one, but when Sylvia asked for one, she was told she had to save up $5 to cover the late fees in case she wasn't responsible with her books. Through the Girl Scouts, Sylvia began to learn about her own value and that she could develop the skills to have any future she wanted for herself. Of course you'll want to hand this memoir to passionate Girl Scouts, former Girl Scouts, and troop leaders. Also give it to kids who enjoy reading about others' real experiences or are curious about what childhood was like in the 1960s. Almost Astronauts: 13 Women Who Dared to Dream by Tonya Lee Stone (Candlewick, 2009) is another gripping story about women who are told they can't, but they go on trying anyway. Readers who are interested in more books about women in the sciences despite odds being stacked against them may enjoy this one. I Am Malala by Malala Yousafzai (Little, Brown, 2014) is another memoir of a girl facing odds stacked against her and coming out in support of the education of women. Readers interested in personal stories about women standing up for their rights to have an education and careers may enjoy this one. First Girl Scout: The Life of Juliette Gordon Lowe by Ginger Wadsworth (Clarion Books, 2012) is a great choice for readers who are Girl Scouts or who are interested in the history of the Girl Scouts. Small Steps: The Year I Got Polio by Peg Kehret (Albert Whitman, 1996) is another great memoir to suggest to kids who are curious about what life was like for children growing up in the 1950s and 1960s. Path to the Stars: My Journey from Girl Scout to Rocket Scientist by Sylvia Acevedo. Grades 5+ Clarion Books, September 2018. 320 pages. Reviewed from ARC provided by publisher.